Add crabs, and perhaps by extension other crustaceans, to the list of animals negatively affected by shipping noise in the world’s oceans. 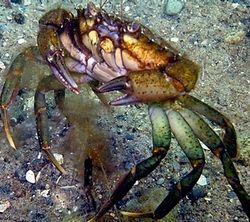 Working with the same common shore crabs that children delight in catching on crablines in UK harbours, the team found ecologically-critical effects of ship noise-playback on behaviour. Cetaceans (whales and dolphins), fish, and larvae of reef creatures have previously been found to respond to shipping noise in ways that can increase energy expenditures and stress levels; this is the first clear indication that crustaceans are also negatively affected.